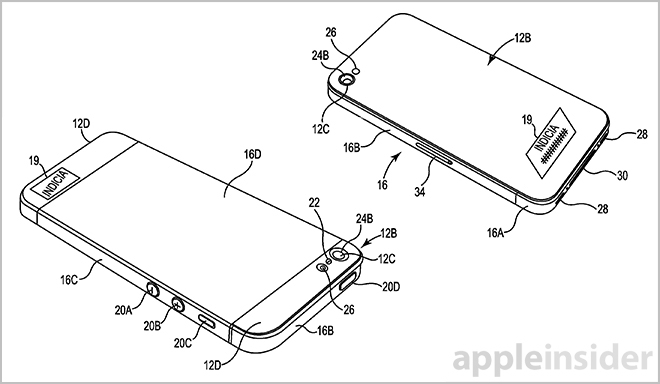 Ahead of Apple's expected iPhone announcement this fall, the company has filed for three sapphire-related patents pointing to a handset with front cover and illuminated buttons crafted from the exotic material. The U.S. Patent and Trademark Office on Thursday published Apple patent applications covering a method of strengthening weak regions in sapphire display cover, illuminated sapphire physical controls and implanting of markings beneath a sapphire surface. 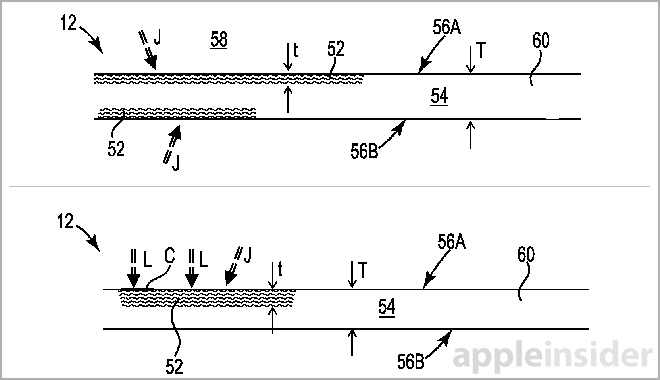 Perhaps most relatable to current rumor and speculation is Apple's invention for a "Sapphire component with residual compressive stress," which describes a method of shaping and selectively generating residual compressive stress in aluminum oxide ceramic (sapphire) material to strengthen specific regions prone to breakage. Earlier this week, a video hit the Web showing a purported "iPhone 6" display cover glass supposedly made from manufactured sapphire. While the material is in question, the actual part showed resilience to both knife stabs, scratches and extreme bending, suggesting it may not be made of industry standard Gorilla Glass. The properties outlined in the invention are very similar to those seen in the video. For example, the filing specifically points out that incorporating residual compressive stress to sapphire provides impact resistance, enhanced strain performance and overall durability. Regions with compressive stress are substantially more resilient than regions not treated by the procedure. Illustration of regional residual compressive stress applcation. As detailed, the invention applies to a device's cover glass components —front, back or both —formed from a sapphire crystal material. To improve shock and impact resistance, compressive residual stress regions can be formed on the inner or outer surface of the glass window. Any suitable method can be used to create compressive residual stress, such as annealing, tempering, quenching or other such techniques. Laser heating or strengthening may also be used for more exact applications. For example, in some embodiments, the depth of residual compressive stress regions can be varied to provide customized strengthened layers for high loading conditions. In cases where damage is unavoidable, a failure guide may be applied through the process to define a fracture pattern. Depending on the type of device in which the sapphire is mounted, the residual compressive stress treatment may be applied on corners and edges, or the center portion of the glass. Various treatment techniques including laser heating process (bottom). 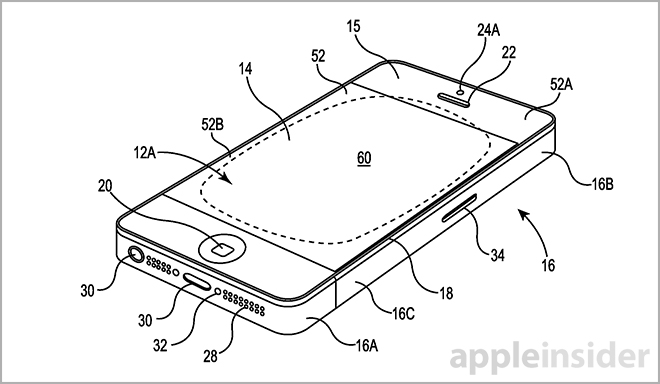 Apple's second sapphire invention deals with ceramic inserts, or sapphire buttons and physical controls that can be integrated within a device housing. Titled "Ceramic insert control mechanism," the application outlines techniques by which physical control members like home buttons and volume rockers can be made of sapphire material. 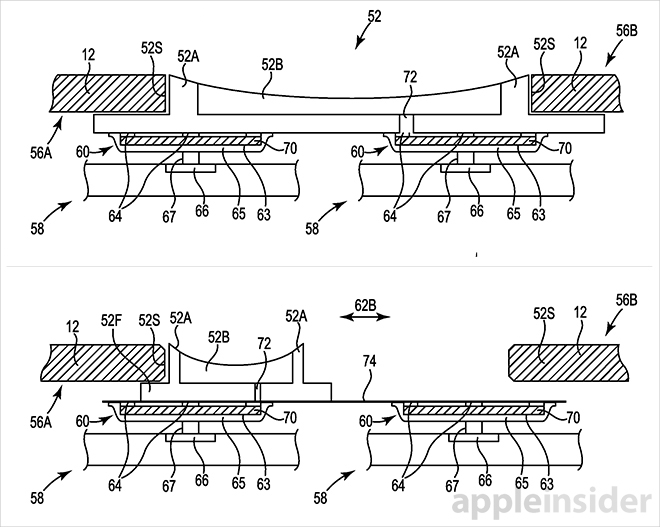 Like current iPhone controls, the patent filing describes sapphire parts that operate actuators by pressing, sliding or toggling the component manually. These controls can be mounted within a device housing or inserted into a sapphire display, like the iPhone's home button. Illustration of button actuator (top) and sliding switch. To prevent damage, bearings, insulators or shims may be positioned around the sapphire part. These parts can be opaque or made of a material that shares the same index of refraction as the sapphire, forming a matching structure. Apple has already introduced a variation of this patent in the current Touch ID fingerprint sensor, which uses a sapphire cover glass to protect the sensitive circuitry embedded in the component. The filing also mentions the use of LED lighting to illuminate the sapphire part, either by being located near the mechanism's opening or channeled there through a light guide. Finally, the third patent application deals with the more mundane task of creating markings like serial numbers and trademarks that are visible through a sapphire glass structure. As described in Apple's "Ion implant indicia for cover glass or display component" invention, a subsurface pattern or marking is embedded into either the face or back of a sapphire glass pane. Using ion implantation, the method alters an optical or chromatic property of the sapphire material at a subsurface layer, leaving a mark that is both easily readable and protected from the elements. Possible ions to be used with the process include chromium, titanium, or iron, which are then accelerated in an electric field and implanted in the sapphire component. Different ions can be used to create different indicia colors, while certain applications may just slightly change the perceived optical qualities in the glass. The indicia can show a device's make and model number, or other pertinent information. In other embodiments, ion implantation can be used as labels for switches and other operational components. 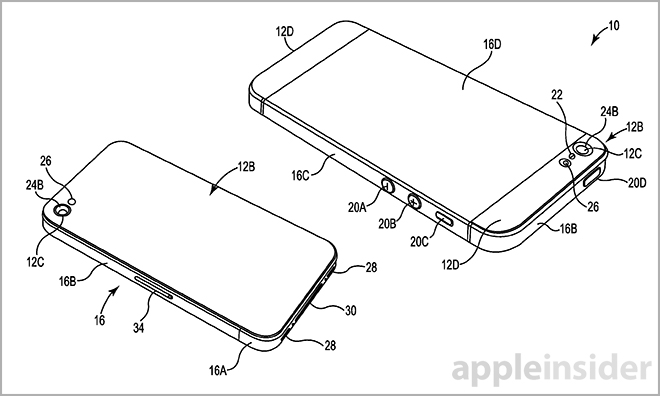 All three Apple patent applications were filed for in January 2013 and credit Kelvin Kwong as an inventor. The ceramic insert property also cites Benjamin J. Pope and Nicholas G. Merz as inventors.